I spent more time than usual in front of my computer today and as a reward left my more enjoyable and interesting e-mail for the end of the day. I was struck by the juxtaposition of two articles. 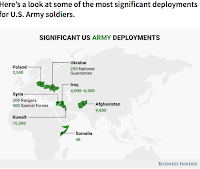 The first was from the May 17, 2017 Task & Purpose, “5 Maps that Show The Military Hotspots The US Military is Deployed Right Now” (see: http://bit.ly/2raCZjY; which is also a photo source. As an analyst I tend to look for things that are unusual. 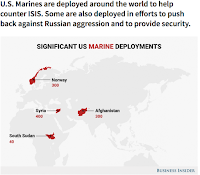 Top of the ‘unusual’ list is the deployment of 300 Marines to Norway. 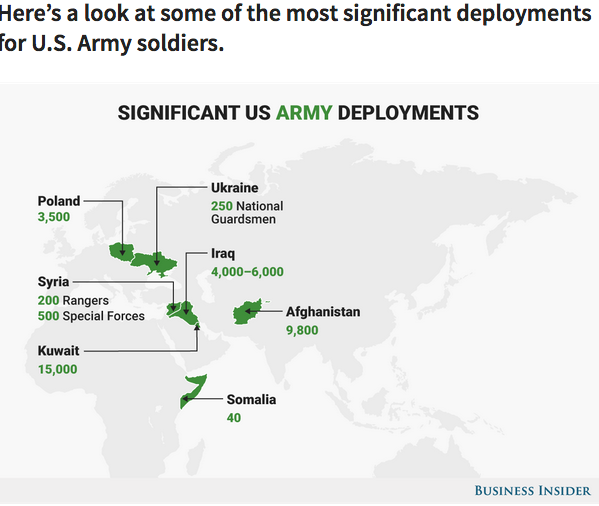 The Army’s list showed a deployment of 3,500 in Poland. 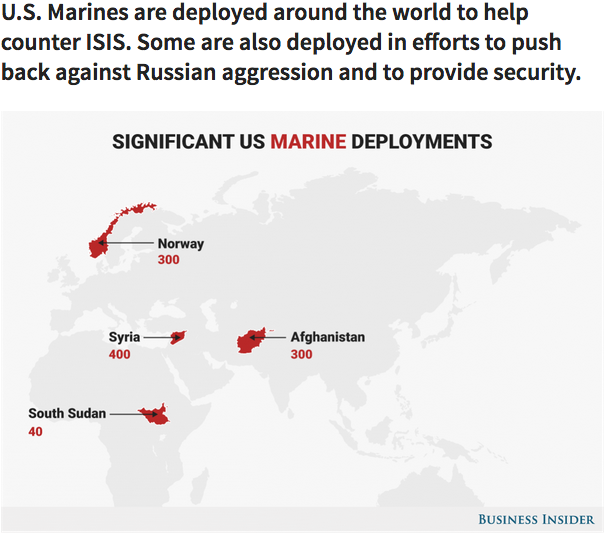 These two deployments are clearly meant to counter a perceived Russian threat and/or to make a statement about one. Given the headlines of actions in Afghanistan, Iraq and Syria – these two stood out. 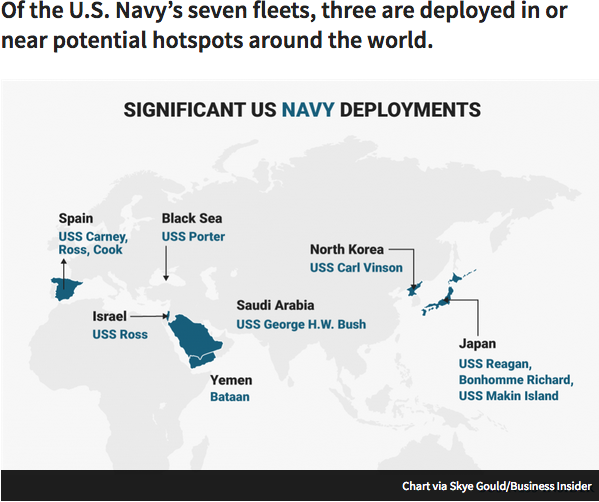 On the Navy list I was somewhat surprised to see that the USS Carney Ross is deployed to South Sudan. I thought South Sudan was land locked which would make it a bit difficult to deploy an Arliegh Burke-class guided-missile destroyer inland. 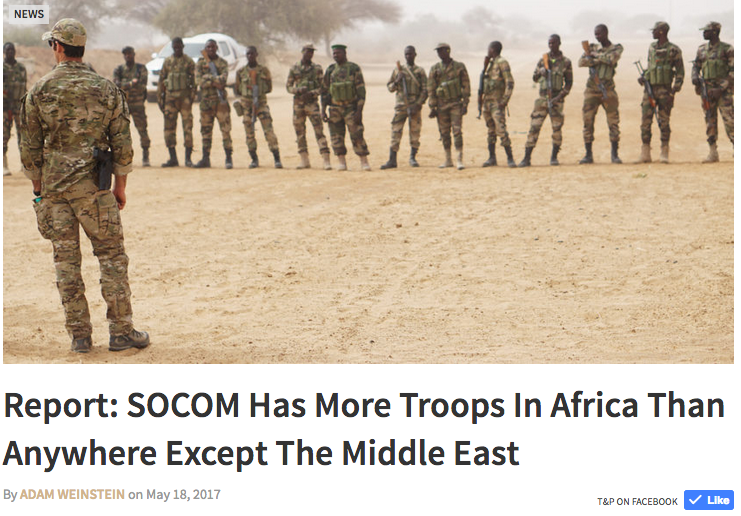 One could view the non-SOCOM Deployments as actions that are in play. Meaning that these conflict areas have enough going-on that it is necessary to station conventional forces. 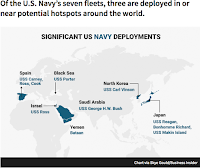 The Marines and the Navy, generally viewed as more mobile can be shifted to other locations more quickly. Reader comments, as always are encouraged and I’m especially curious as to feedback on the Carney Ross. I have been an on-line instructor for American Military University since 2009. My students are not easy to categorize except they are mostly either serving or former military or individuals seeking to break into the intelligence community as a career. AMU and its parent, APUS, offer asymmetrical courses. This means the students and the instructors are not on-line at the same time. The materials started out like traditional, brick and mortar schools meaning they were a combination of documents and books. Video is generally considered a way to make the ‘classroom’ more inviting. I fact, when I developed a course for AMU entitled “Cyber & The Intelligence Cycle”, my supervising Faculty Director told me I had to provide 20 minutes of ‘entertainment’ for the students. If you’re interested, let me know and I’ll send you a like to one of the PPT lectures that I recorded with my voiceover. Apparently the use of videos in on-line education is an international trend. 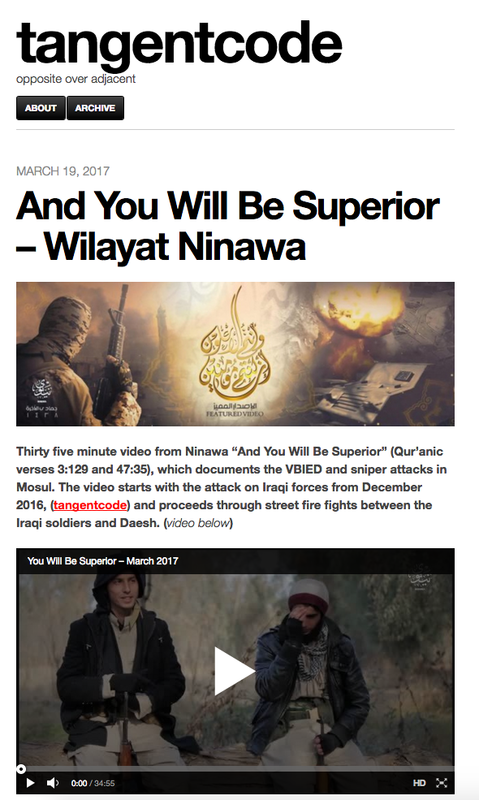 While researching for this week’s Blog post I saw some information about Wilaya Ninwa, the propaganda arm of ISIS. In rummaging around the Internet I came across a new source (see: http://bit.ly/2qt4rIv, which is also the photo source). The reference to the trigonometric formula that the tangent = the opposite/the adjacent was not lost on me and indicates a unique analytical perspective. 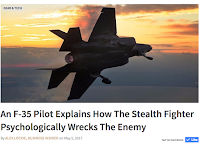 They featured a 35 minute video among others. 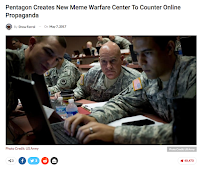 The referenced link offers some analysis of the video as well as some clips. I was struck, not by the fact that they were using videos, but the length. Given the probable target demographic I was quite surprised that the video is over 10 minutes long. 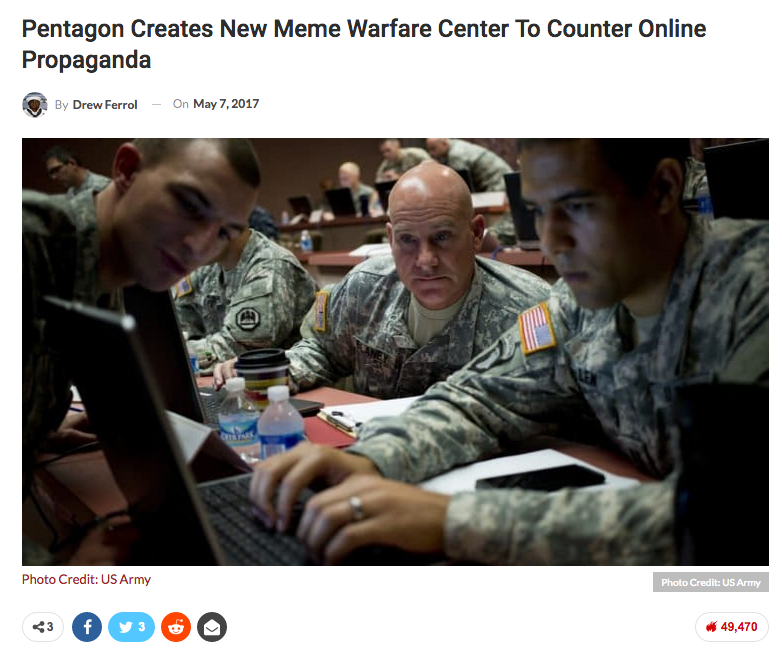 Perhaps this because the video is meant to be a recruiting tool or a subliminal persuader and not a being a training vehicle. As I learn more about video, it appears that 10 minutes is the sweet spot. I’d be very interested in learning what readers have to say on the subject. Once upon a time, in a far away land called IGMR (Indiantown Gap Military Reservation) an intrepid young Army ROTC cadet was leading his squad down a road when an enemy tank rumbled out in front of us. That event had quite a psychological impact. Fast forward to March 2017 when the same cadet was a retired Colonel SME orchestrating an influence campaign designed to convince an adversarial military CDR not to lead a convoy on an attack mission. While the 'shock action' of tanks was not appropriate, one avenue that open was to have a couple of ‘fast movers’ fly over the convoy sending the not so subtle message – if you move forward, the next time these jets won’t be so benign. There is a great deal to be said in favor of non-lethal action to get results. One technique is to employ lethal weapons in a PSYAct – a psychological action – designed to send a strong sensory message. Other PsyActs do not have to be as dramatic. While I was in SFOR Bosnia US personnel were generally dressed in ‘full battle rattle’, meaning helmet, flak vest, etc. The British on the other hand were not. In a confrontation the Americans had little in the way of non-lethal options while the British Army could simple go to their vehicles and ‘suit up’ in their battle gear sending a pretty strong message. The bottom line is that all manner of influence can be employed and the psychological impact of kinetic weapons in a non-lethal message can be quite effective.